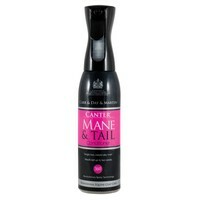 Canter Mane & Tail Conditioner has been carefully formulated to keep the mane and tail sleek, tangle-free and luxuriously soft. A powerful detangler and long-lasting conditioner, Canter Mane & Tail makes grooming quick and easy, and reduces hair breakage while leaving an immaculate, oil free shine. Manes: Spray the fine mist over the mane and brush or comb through well. Tails: Hold the tail away from the horse, then gently drop sections of the hair through the mist spray. Brush through with a soft body brush or comb. For best results, shampoo first. Can be used on wet or dry hair. Results are immediate and last for up to 2 weeks.